Riches, a South Carolina inmate serving a sentence for wire fraud who has his own Wikipedia entry, apparently kills time while incarcerated by filing briefs like this.? Earlier this year he sued Rockstar Games over similar claims involving Grand Theft Auto IV.? Riches has, at various times, also sued George Bush, Michael Vick, National Public Radio, Barry Bonds, Plato, and the Eiffel Tower. 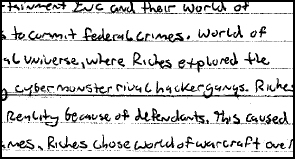 …caused Riches mind to live in a virtual universe, where Riches explored the landscape committing identity theft and fighting cybermonster rival hacker gangs.? Riches was addicted to video games and lost touch with reality because of defendants.? This caused Riches to commit fraud to buy defendants video games.? Riches chose World of Warcraft over working a legit job. Riches mind became a living video game. The Arizona court will likely find procedural grounds to dismiss this motion without considering the claims on the merits. The State Administration of Taxation said on its Web site Wednesday (in Chinese) that China will impose a personal income tax of 20% on profit from virtual money. The announcement, which was distributed to local tax bureaus, specifically takes aim at those who buy virtual currency from gamers and surfers and sell it to others at a mark-up. Taxation officials are granted the right to determine the original price of online virtual currency if the individual fails to provide proof of an original price, it says. There’s actually not much debate over the whether profits made on sales of virtual goods and currency are taxable in most jurisdictions (at least upon conversion to real cash) but it’s interesting that China has moved to specifically capture this revenue, and has even created rules governing collection. 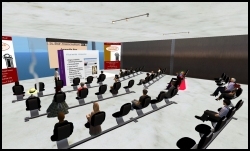 As part of the SL Bar Association’s speaker series, I’m presenting “Ethics of Practice in Virtual Worlds” in Second Life Saturday, November 8 at 12:00 Noon Pacific time. The presentation follows next week’s SL Bar Association meeting, and is free to attend. California CLE credit, including 1 hour of California Ethics CLE, is available for $25, which covers the expenses associated with CLE certification.? The seminar is open to everyone, though it will be more interesting to lawyers than non-lawyers. I’ll be talking about a wide range of professional responsibility issues that should be on the radar of any lawyer practicing — or thinking about practicing — in a virtual world.? I’ll discuss advertising in virtual worlds, confidentiality of communication, unauthorized practice of law, conflicts of interest, and much more.? I will also take questions. You can sign up for a free spot at the seminar and also sign up and pay for CLE credit at the SL Bar Association’s site.? You can pay for the CLE credit via PayPal or in-world using Linden Dollars. Linden Lab had previously indicated it would contest entry of a Preliminary Injunction, but apparently decided it wasn’t worth the fight.? The Preliminary Injunction doesn’t do much more than lay out a path for Minsky to bring SLART-branded objects in Second Life to Linden Lab’s attention and have them removed from the virtual world, so Linden Lab likely did not see much upside to devoting resources to fighting it.